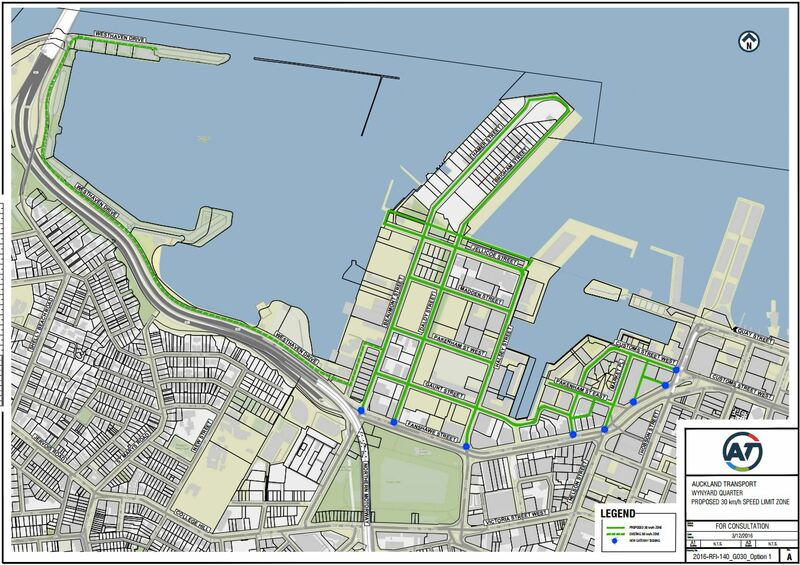 Change the speed limit from 50 km/hr to 30 km/hr on the area known as the Wynyard Quarter and Viaduct Harbour, specifically on the roads shown on the attached drawing. Install a flush median on Hamer Street and parking improvements on Brigham Street to make the roads more appropriate for a 30 km/hr speed environment. Install a new signalised pedestrian any cyclist crossing across Upper Queen Street. Install new pram crossings (with directional pavers). Treat the surface of the footpath for safer walking and cycling. Relocate the existing ‘Shared Path’ signage. Change the road markings to reflect the improved layout. Owens Road, Epsom – Clearway – (Closes 1.02.2017) Proposing to install a Clearway to help reduce congestion on Owens Road. The clearway will operate on weekdays from 7am to 9 am and from 4pm to 6pm. Goodall St, Hillsborough – No stopping at all times restriction – (Closes 1.02.2017) Proposing to extend the No stopping at all times restrictions on Goodall Street, Hillsborough. The proposal is to extend the existing restriction by 27 metres. Lintaine Pl, Glen Innes – No stopping at all times restriction – (Closes 6.02.2017) Proposal to add No stopping at all times restrictions (broken yellow lines) on the western side of Lintaine Place in Glen Innes. The change is required to address the accessibility issue caused by the narrow road width. When cars are parked on both sides of the street, emergency vehicles and other large vehicles are unable to access the end of the street. Remove the slip lane from Edmonton Rd turning left on to Great North Rd. Relocate broken yellow lines (BYLs) due to the loss of the slip road. Install road signs on Great North Rd. Relocate street lighting at pedestrian crossing. Install belisha beacons at pedestrian crossing. 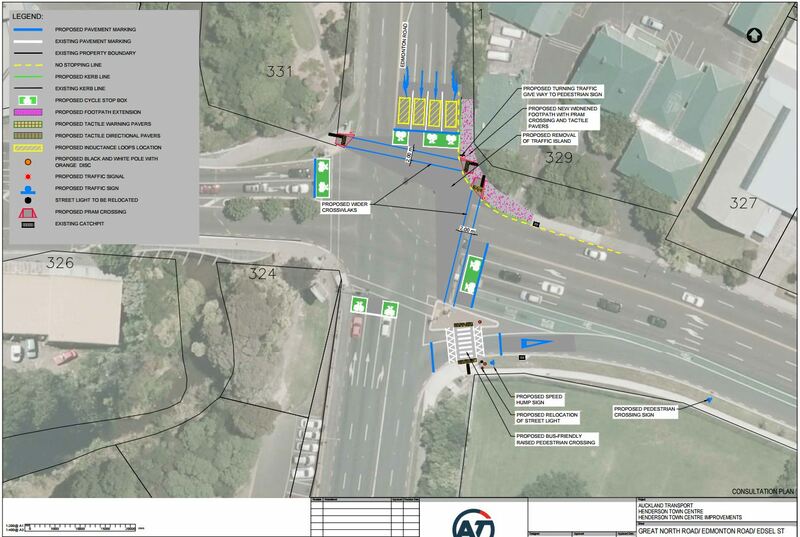 Remove left hand slip lane from Great North road on to Alderman Drive. Reconstruct footpath in place of slip lane. Relocate broken yellow lines (BYLs) from old slip lane. Remove pram crossing and replace with footpath. Add pedestrian crossing and belisha beacons over the left hand slip lane of Great North Road heading North. Install new pram crossing across Alderman Drive. Proposing new ‘No Stopping At All Times’ restrictions to extend on both sides of Maioro Street between New Windsor Road and Cordelia Place. The removal of the existing clearway signs on both sides of the road on Maioro Street. 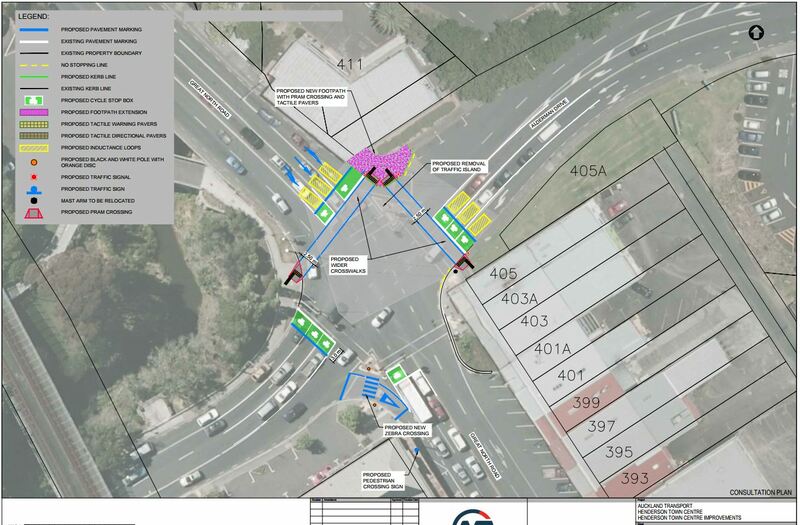 AT propose to add broken yellow lines around the intersection of Narek Place and Plunket Avenue, as well as add broken yellow lines at the end of Narek Place. So if you see something that interests you, I encourage you to submit. No parking at all time here will work ONLY if AT also enforce footpath/berm parking at the same time; otherwise the problem simply moves from slowing cars to slowing pedestrians. Good to see that Upper Queen crossing. Will be important with the Ian McKinnon Drive path coming up on west side, for people then wanting to go to Grafton Gully – but also people from Symonds going to Lightpath. What on earth is with that flush median!? Separating oncoming traffic encourages faster driving. They see the median as necessary because it’s a 30kph zone? This is from the upside down world. Have these traffic engineers not heard of the Peltzman Effect? Where are they trained? Take it out and there could be parking protected cycle lanes. Or centre running Light Rail…. What are they thinking? Nice space for overtaking space for anyone frustrated with a driver actually observing the 30 kph speed limit? Boy racer drag strip? When are they developing that area, it’s not public access atm is it, I know its part of stage 3 and we are on stage 2 atm? Seriously does anyone know why they think a flush median makes the road more appropriate for 30km/h? I can’t see any connection. As much as your world is devoted to non-car options, you must remember that cars still exist. While cars slow down to find a park, or to reverse out of a car park, the flush median is available for the cars behind to overtake, so that the whole road is not clogged up. Whoa, median strips aren’t for overtaking maneuvers! A car pulling out has to give way already. Flush medians move traffic that is turning right to have somewhere to wait. They are also purported to provide pedestrian safety, which is pretty weak without concrete or steel refuges. I suspect the reason this is being proposed is that it’s a poor mans version of road narrowing, it will seem more appropriate to go 30kmph for about 3 minutes of the design’s life because it’s just paint. Much better to use that same paint to mark out a parking protected cycleway to the end of the silo park that has awesome harbour views. The only saving grace is that it’s easy to fix the paint later on, but it’d be much better to paint down the PPCW now, so it’s established infrastructure for any new development in 4 years time. Yes the flush medians are not an overtaking lane. But they provide space to overtake when safe and necessary. A good example is Mt Eden Rd between the Mt Eden Shops and the Mount Eden. The winding road there has a flush median which obviously is not used for overtaking. But sometimes if there is a cyclist who insists on riding as far to middle of the lane as possible at 30kph, then you will see people pass the cyclist by driving onto the flush median, to give the cyclist 1.5m of space. If no one did that, we would have a whole trail of cars behind the cyclist. Also, when a car begins to pull out, there may be no cars coming. But once a car is half way out of its parking spot, a car may arrive. You cannot expect the car that is pulling out to stop and drive back into its parking spot. In this case, the car that is coming can drive onto the flush median, ‘around’ the car that is pulling out. Lastly, I know it’s legally allowed, and I had to do it as part of my driving test, but rarely do you see people who are turning right turn into the flush median. They only turn once it is clear from both right and left. This is because turning into the flush median to wait for a gap is quite risky. There may be a car coming from your left, turning into your street, using the same spot on the flush median at the same time. lol – isnt that the ‘car may arrive’ duty to slow and allow the person to exit the car park!!!! you’re not meant to just drive around them – essentially overtaking. But more to the point – Why are they trying to provide the median in the first place? Hamer St is not a main road. People are there for a reason and driving (unless delivery) really shouldn’t be one of them. It has parking on both sides, plus a lane each way, and (now potentially) a median strip? Surely you meant to say “somebody riding a bike safely outside the door zone”? Exactly, if you have lots of cars turning right on a fast flowing road you might want a flush median to prevent rear end crashes. Hamer St doesn’t have lots of right turns nor is it high speed so there is no point putting in a flush median unless you just want to narrow the lanes down and you are completely bereft of imagination. If a following car has to wait because someone is turning right then what is the big deal? It won’t be a significant delay. 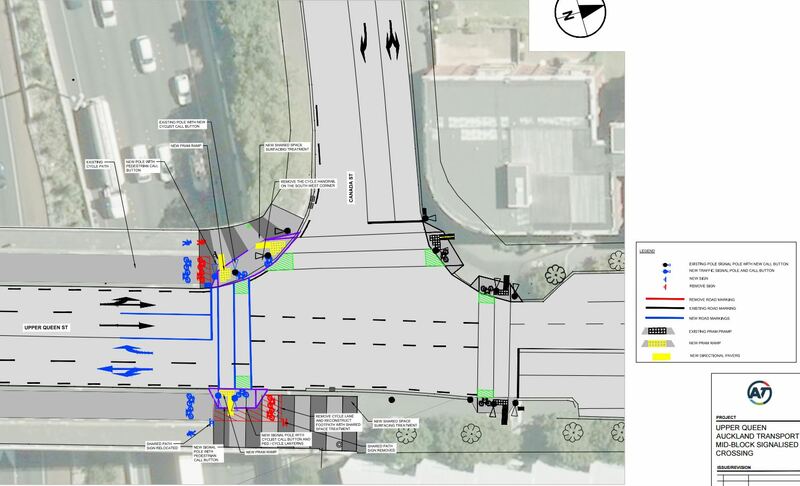 I’d say that the thinking is to narrow the really wide traffic lanes to something narrower (basic theory being that narrow lanes calm traffic) – except that the remaining traffic lanes will still be 4.2m wide! So in reality that will provide no practical encouragement to slow down to 30km/h. I like the idea of running a separated bikeway down one side, and then having a narrower roadway for the rest – mind you, the point of a 30kmh zone is that you shouldn’t need special cycle facilities… Or perhaps provide alternating angle parking (or even central median parking) to break up the straight sight lines down the road; that would reduce the perceived speed environment. Remember there is still a significant amount of reasonably heavy industry on Hamnar street, with the boat yards that can launch and haul superyachts, about the only concrete plant that can adequately service downtown Auckland construction sites, and tank farm is still operational. I suspect there is a requirement for over dimensional load access into these areas, one reason why a cycle way wasn’t put between the parked cars and the footpath. Hamer street is sooo wide, but seemingly no room for footpaths or protected cycle ways. Plenty of room to move the deck chairs around for vehicles though, it seems. So claims to be enhancing bikes/peds are pretty flimsy. What happened to the Wynyard Quarter plan reducing car/sov movements to 30% of all modal activity, and reducing on street car parking? The whole exercise seems to be smoke and mirrors. I mean signs and paint. The Westhaven Drive ’30kph’ limit is a joke – and the speed humps have been compressed to uselessness. AT say it is not their problem – “please try ‘Waterfront Auckland as it is their responsibility”. I just dislike the half a** job we’ve done with the crossings now they for most parts removed the flashing Belisha beacons from many crossings and replaced with orange disks. If we’ll going to do that, why not just swap the orange disks with the blue cross signs that are used in many other countries or use the US diamond crosswalk signs? – Updating the road markings and signage of the existing northbound and southbound cycle lanes between Asquith Avenue and Duncan MacLean Link. – Installing rubber kerbs with reflective posts to physically protect people in the existing cycle lanes from adjacent traffic between Asquith Avenue and Duncan Maclean Link. Given that everyone seems to be upset about the flush median and this is a post about consultations, I hope you are all making a submission? Not that I can talk, I don’t live in Auckland so will not be making one. I don’t live in Auckland but I will still be making one, ridiculous that professionals have to volunteer our time to fix AT’s terrible proposals. Fully support the speed limit reduction around the Viaduct. Westhaven Drive has always been limited to 30 kph and I dare anyone to try and exceed 30 kph on Beaumont Street during the day. Does not need any consultation, they should just do it. And on Westhaven Drive it should apply to cyclists as well. No one has mentioned Len Brown’s white elephant – the Viaduct tram system. Has not been run for yonks. Any idea when it will get going again? Good chance for it to be transferred to run up and down College Hill. I saw it running when I was down there on Monday. I thought it was a Mike Lee project though, Len was more of a heavy rail proponent (with good reason). The Wynyard Tram system is a tourist attraction with no value as transport. We need the larger modern LRTs down the Isthmus to move the needle on PT demands. That’s right, the Noddy-tram is a Mike Lee white elephant, like the mis-sited Parnell station. Not Len Brown’s doing. 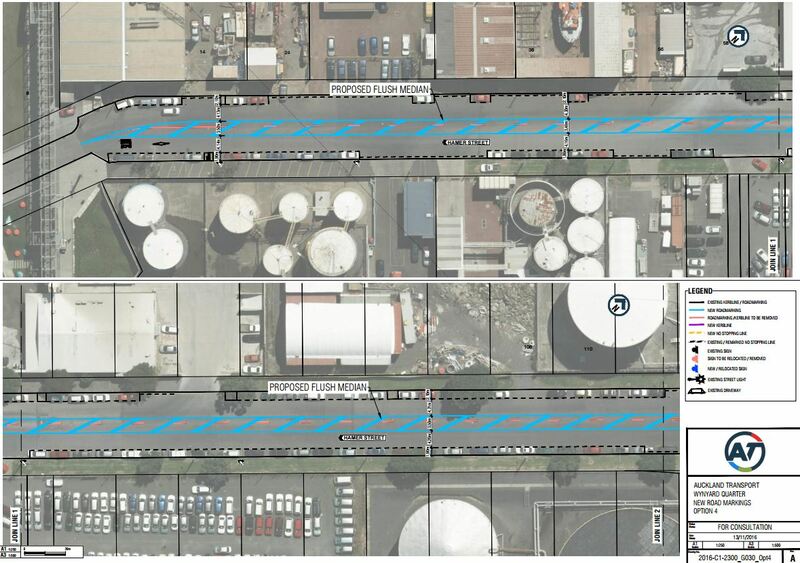 Good to see the 30km/h limit for Wynyard Quarter. However, those advanced stop boxes seem kinda weak out west- how on earth is one supposed to get to them! Haha median strip as a form of road narrowing!!!!!! I’m actually absolutely fine with this, as long as the median strip has raised kerbing, planting. E.g not a actual median strip. There is still industry down there and with industry comes trucks, sometime large trucks so planter boxes or raised medium strips just become added obstacles for large truck tyres. Yes but at 30km/hr that shouldn’t really be a problem, and as the vehicles are not even 3.5m wide, it takes a really bad truck driver to not be able to navigate a 4m wide street environment. Car-parking extents would need to be spaced so trucking curve radiuses are meet, and entry exit points within the planter boxes set at an appropriate width (remembering 30km/hr speed limit). There are not many over-dimensioned loads that travel through this area, but as one is being undertaken planter boxes can be moved as part of their TMP. The biggest traffic comes from the Firth Concrete Plant, and their trucks aren’t particularly that big (although concrete truck drivers are notoriously grumpy). Any moves to improve cycling and walking in Henderson have my approval. There are lot of improvements that could be made, removing some of these slip lanes is a good start. I think the 30km speed zone is great. In my opinion pretty much all residential roads should be 30kph speed zones, except arterial roads. Also the city centre between Hobson, Customs, Anzac/Symonds and Mayoral should all be 30kph, maybe with the exception of Albert St once it’s back to being a bus corridor. I also welcome the additional crossing on Upper Queen / Canada, have thought many times it should have one. Carrying on about the St Lukes Road cycleway – it’s my local – the eastbound cycleway ends in a taper at Selkirk Road, leaving cyclists nowhere to go but onto cul de sac Selkirk Road, and then onto a very narrow footpath between Selkirk and New North Roads. There is plenty of room to cut back the grassy berm on the side of the road between Selkirk and New North Roads and continue the cycleway to the lights at New North and St Lukes Road – what happens after that is a different question, but it is crazy simply stopping a cycleway 50 metres short of its destination.